First I should start with, I killed the cable mode the other day by water so tilted plant. And who is the more intelligent species? Now it’s time for free fast food wifi!! I first bought this Anthurium around 2010. It was bought at an estate sale in Berkeley California, it was sitting in a sun room along with a yellowed Hoya. Both seem to have been forgotten many years ago more than likely when the owner pasted away. I had no idea what it was, I was just amazed that judging by the container and the home it must have been there for decades. The leaves were giant, at least 4ft long dark hunter green with this white shine and tons of dust. I think both of these plants, were only living on the condensation and humidity the sun room/mud room would gather in the winter. I brought them both home, gave them water fertilizer and bright windows. Both turned out amazing! Because of the stress the Hoya lived in, it rewarded me with a huge flower show. It was funny seeing it covered with yellow crippled leaves, maybe one or two new green ones and all these flowers. The Anthurium rewarded me with more huge leaves and a few flowers. I was just keeping it watered and fertilized. I always wanted to change out the 40 year old soil and plant it deeper. It had this palm tree effect going on, the leaf area was growing like 6in out of the side of the pot. The pot just had the roots and the rest of the plat was 6in off to the side. In a tragic series of events almost three years ago I lost my home, partner and sanity. Both I and the Anthurium managed to make it out of all these events and be reborn. Out of my home the Anthurium is only one of a few things that managed to survive. It seemed everything was destroyed including myself. All of that added to a lot of attachment to this odd plant from who knows what part of the world. It was a plant that I had given my friend, before I tragically lost him in those events. I had wanted him to learn the basics of plant care and this monster seemed perfect! When I found the Anthurium it was on the floor and all the foliage missing. I was surprised the pot wasn’t smashed and only a little soil missing. Later I found out most of the “soil” was packing peanuts! 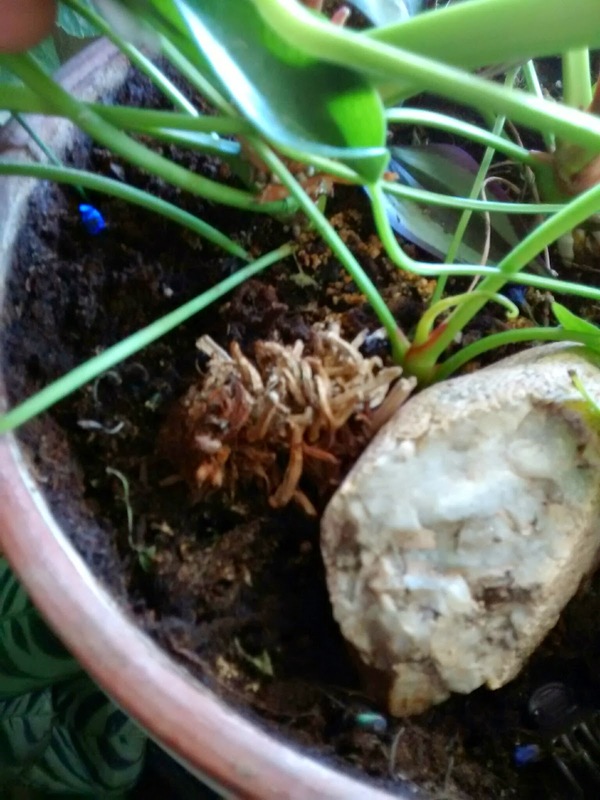 I had no clue if it would survive or not, but I grabbed it. Later it sat in the back seat of my car open to the element for over a month in the winter. I pulled it out with a few other plants, that didn’t make it and gave them some water. Not knowing what to expect I brought them out with me to Arizona. Around the fifth month of being here, not paying much attention to the Anthurium except to watering every now and them. I started to notice small green sprouts. They took a long time to resemble anything. Once they started to resemble leaves, the new kitten we had at the time now cat had deiced to nibble on the leaves. It’s not like the poor thing didn’t look bad enough before, now it looks like a giant caterpillar had ate at it. After the second round of leaves and the poor Anthurium just not doing much I opted for a full repot. I swear I must have repotted this guy three times so far. Plus I also had a few of the young sprouts in water over the months. I ended up, with six YES six plants! I now have a family of Anthurium, I was shocked! I was still concerned of losing the little family so I made sure to wick the pot and place it on a nice large tray. This made sure it would always stay moist and provide some humidity a big pit fall of Arizona. Eventually they all soon started to grow and grow. The new growth wasn’t changing in size much and I was really afraid I would never end of with those giant leaves it once had. Over the years that I have been here, he has seen some friends join the pot. I have added other plants to help keep the family of Anthuriums alive. I wanted to add plants that would drink up the water faster, and others that did enjoy moist soil like the Anthurium. The first was a Norfolk Pine that belonged to my father that I also lost in those events. 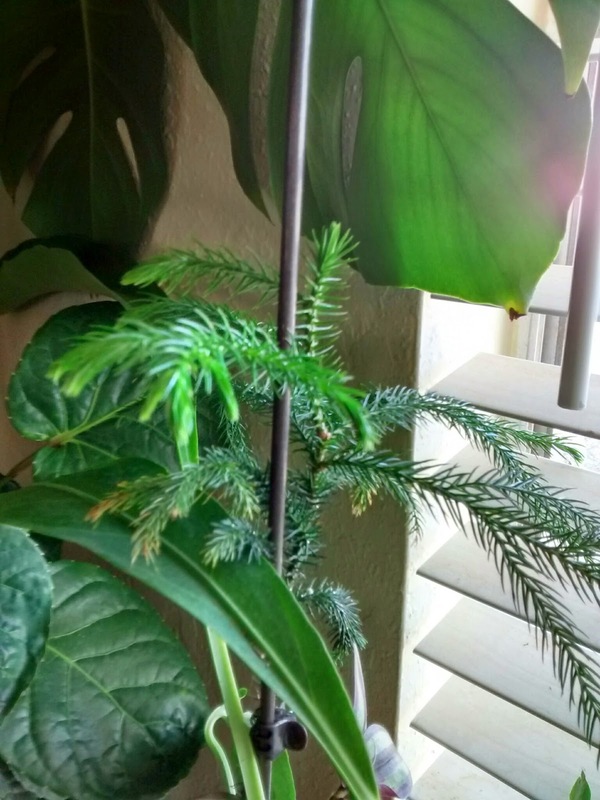 I had given him this Norfolk pine for Christmas in 2011. It was another stubborn plant! It sat for so long with no signs of life, as the rest of the seedlings slowly died I lost hope of it ever growing. Since the t grew! But then somehow the growing tip got broke. After that heart attack, a new one sported so I Anthurium was doing so well, I opted to throw him in there. I said, you can grow if you want! Well istarted training it up. The Second plant to join was a purple Tradescantia zebrina 'Wandering Jew Purple'. My neighbor had bought one in a four inch container and then she left it out during the winter. I ran out and grabbed some pieces that survived and started another four inch container. A piece of that broke off and went into this melting pot last spring. Then this winter, it become many many many more plants. 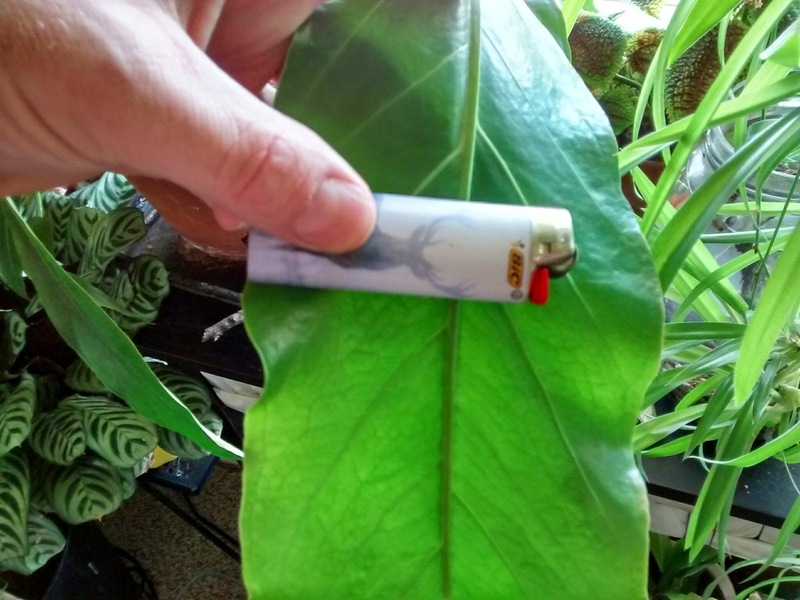 A few months ago, I noticed a new leaf that looked pretty darn big! I watched it grow and grow. Then today I measured and It is over 32” long! From tip to plant base. I am really amazed at in this sort period the leaves have gotten this large! I thought it would take 10 years! It seems by me tending to the needs of this Anthurium trying to keep it alive. Has re-sparked all my interests in gardening/history/antiques. I really lost my will to live, during all those incidents. Because of that I was also diagnosed with real bad PTSD. As anyone who knows, this comes with its own baggage. The new little family of Anthuriums really brought up my spirits big time, it just sparked so many of my interests again. That just seemed to snow ball into many other great things. All these cool interest sparks really keeps my mind from focusing on things that had happened during that time as well. I also must say, that I blame this Anthurium family for starting the interest to start the urban garden (see link). It will be something that I can do on my own, but can share with others. I really feel like the little corner of America gone by in Salisbury, Missouri is a way to both give me and this Anthurium a future for many decades. He’ll have his green house and I will have my house. Then there will be this odd church seeking restoration. What will that spark? As to the life of the Anthurium, only time will tell. As for my next step, it is going to go on a road trip to Salisbury Missouri to look at the property. I am personally a nervous nelly over all this and I have no cash for an offer. I just person want to save the property from the wrecking ball and its 160 years of history. It is a sad day in history when simple structures like these have no value as historical objects and need too many figures worth of restoration work to make it a viable “flip”. Oh another quick one, I am looking for the Botanical name for this Anthurium. I would love to know/see a picture of what the “In the wild” version looks like! I will leave with my pics of the birth of spring! !